Mr. “Foxy” Fox is no Mr. Bombastic. No failing elastic, just gymnastic and rather fantastic. stealing chickens, squab, cider and more. But what of Boggis, Bunce, and Bean? “One fat, one short, one lean. Caught in the middle are Weasel, Rabbit, and Badger. Trying their hardest to escape capture. with his procurement of Bunce’s geese. the animals dig like, animals. tempted and shall not stop until the larders are emptied. as Boggis, Bunce and Bean grind their teeth. to help Badger, Weasel and Rabbit. The quirk maestro dons his creative cap and delivers the most marvelous of Roald Dahl adaptations. With trademark symmetry and an adoring colour palette Dahl’s quick brown fox leaps off the page and slings a bluberry or two the lazy dog’s way in Wes Anderson’s most imaginative work. Trademark cottage props add a level of loving authenticity to each of Anderson’s stories and Fantastic Mr. Fox thrives under this creative whimsy. The stop motion puppets do admittedly reveal their crudeness on the odd occasion, a hilarious cussing battle with Badger in the opening ten minutes springs to mind. But the crudeness in this example merely serves to exemplify that while these animals are humanoid in stature and possess many of the same occupations, mannerisms, relationships, and even class differences as humans, they are still wild animals. A point that Mr. Fox brings up on numerous occasions in vivid animalistic expression, poor toast. 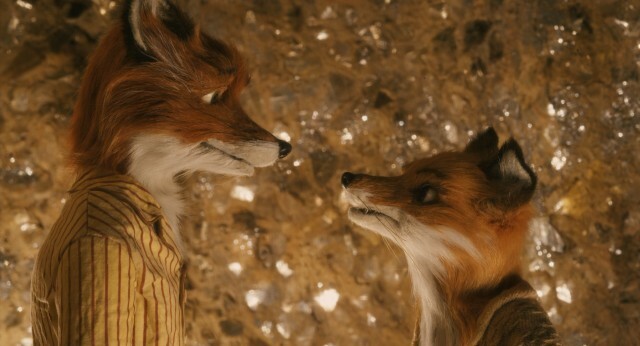 In fact, it is this class difference that spurs Fantastic Mr. Fox back into burglary, a profession he promised to put behind him when Mrs. Fox announced she was pregnant, caught in a fox trap while out stealing squab from Berk. There are more romantic settings to announce the imminent arrival of a fox cub but caught in a fox trap with his sweetheart, the Fantastic Mr. Fox takes it in his stride and settles down for the straight and narrow future that awaits. Writing a newspaper column for the Gazette in a hole in the ground Mr. Fox finds his life bordering on the mundane with his adoringly patient wife and (wobbles hands) ‘different’ cub, Ash. It’s no secret that Mr. Fox misses the days of banditry and soon pursues one last score. But set in his rebellious ways fails to evaluate the threat to Mrs. Fox, Ash and his nephew Kristofferson, not to mention the entire neighbourhood. But in an act that feels like an unofficial christening of his new, not so humble abode, Mr. Fox finds the lands owned by Boggis, Bunce, and Bean with their intimidating factories of temptation glowing in the distance too big to resist. While Ash and Kristofferson struggle to get along below ground, Mr. Fox recruits the bewildered opossum, Kylie, to embark on a dangerous mission above ground: namely, the theft of Boggis’ coveted chickens. Agreeing with unwavering loyalty Kylie sets off in the dead of night with Mr. Fox for one last score, bandit masks at the ready. It turns out that Mr. Fox has bigger plans than a few chickens and his one last score turns into a three pronged attack on the most successful, most dangerous, cruelest, ugliest farmers there ever were. Upsetting Boggis, Bunce, Bean was a mistake and soon Mr. Fox has endangered the lives of all those animals that rely on the safety and comfort of anonymity. The evasion of BBB soon becomes priority number one as their wrath rains down on the neighbourhood, now running scared. Mr. Fox has a plan but I’ll let you enjoy that part without me waffling on. George Clooney and Meryl Streep are a welcome surprise as the voice actors behind Mr and Mrs Fox. The script is flawless and is delivered perfectly. Funny, nuanced and heavily plot driven Anderson never strays from the subject matter and brings the puppets to life through the power of Dahl’s words and enduring creativity. Returning Andersonians include Jason Schwartzmann as Ash and Bill Murray as Badger. While Willem Dafoe reaffirms his Anderson affiliation as Rat and Michael Gambon puts the mean in Bean. A worthy addition to the Anderson canon and a defining film in terms of creative potential and imaginative direction. Roald Dahl’s magical worlds offer an endlessly exciting experience for the reader and Anderson ensured that the experience translated to the big screen. A Brilliant example of how an adaptation should be handled, with care, affection and a creative brush stroke of genius. p.s. If anyone can explain the rules of Whack Bat, I’m all ears. Kristofferson is a natural. I know I’m looking forward to that one. I was so sad that I missed it at TIFF this year. But it comes out late December so not too long to wait. Yeah otherwise I’ll make the trip to NYC. Been meaning to go there anyway. Easier for you than me!! Dude I love that intro. That is brilliant stuff. Only rumours but whatever he is upto I cannot wait! I might try and work out the rules, just for peace of mind!